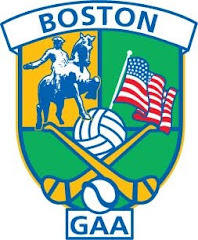 The first action of the 2014 season for the Boston GAA took place Sunday at the Irish Cultural Center in Canton Mass. The weather was brisk, conditions soft underfoot, and the first round of the Pat O'Brien Cup was played on field C. The main field is looking in immaculate condition following the resurfacing job in the offseason, and Field B also underwent work to improve the condition of the surface for the championship this summer, and North American Finals on Labor Day weekend. There were 5 games played, 11 a-side given the smaller field. All the teams got a good run out, with Wolfe Tones, Kerry, Shannon Blues, Connemara Gaels, and Aidan McAnespies recording wins. Collie Donnelly wins the ball for McAnespies. Armagh-Notre Dame met the 2013 cup champions, Aidan McAnespies, with some new signings on board as well as some of the veterans from recent years, and kept pace for much of the first half. The scoring was opened by Dominic Magill with an expertly taken point, however, McAnespies tallied the next 5 scores. Steven McAleer at corner forward looked lively, though Shane McKenna toiled hard to keep the Carrickmore man reined in. Jonathan McGourty saw plenty of the ball in the half forward line, the Leitrim native worked hard throughout. At the break McAnespies led by a score of five points to two. In the second half McAnespies pulled away and started to find a rhythm with some well worked moves that were finished by Collie Donnelly, Cronin Dempsey, and McAleer. Their Brighton opponents managed points from Frank Meehan and Alex Blake and though they ended up on the losing the end, showed well in their first outing. Galway and the Gaels played a hard fought contest with the Gaels coming out on top thanks to some excellent free taking by Noel Graham. Graham slotted over a handful of well taken frees from distance. The Gaels started brightly with some nicely taken scores by Graham, Coleman Mulkerrin, and Tom Sally McDonagh. Galway had Kevin Cummins taking the frees on their side, and the first 2 scores of the game came from the Roscommon man's boot via the dead ball. Each side engineered scoring chances as the ball moved from end to end, but clearly some sharpening of the shooting boots is required as the winter rust still needs to be shaken off with some shots missing the mark. At the break the Gaels led by four points. Galway struck with an Eoghan Kavanagh goal early after the restart. The Inistoige man blasted home from close range as Galway worked the ball well. The Gaels responded well with points from Graham to maintain their edge in the game. The Gaels into the next round as winners. The result of the game belies the nature of the contest. There was never much in the game until the Blues Sean Moriarty buried a solo effort with minutes left in the game. The score killed off the Cork challenge and the Blues went on to add some points to the final tally. The Blues led by two at the break. Cork maintained touch with Mick Lyons kicking a couple of well taken points. The second half was where things opened up a bit more for the Blues. With the middle of the field anchored by American Born duo, Conor Fitzgerald and Pat Murray, the Blues goaled early. Cork fought to keep in it, Cian Clifford worked hard in midfield, and Mike Moynihan kept the points tally ticking for Cork. Moriarty's goal, however, put too much distance between the sides and Cork's hopes of an early season win faded as the Blues move on and Cork meet Donegal in the back door round. Kerry looked impressive as they faced rivals Christophers in a clash of Munster rivals. Back in the Kingdom's fold was Robbie Croft. The Naomh Barrog clubman showed all of the energy and accuracy of his previous stints with the Kerry club, and tallied a total of 1-7. The goal came from the penalty spot. Kerry fielded 3 local born players, Joe Kennedy, Ryan Evans, and Mike Moriarty; Kennedy chipped in with a goal for the Kerry tally. For their part, Christopher's Boston area natives, Danny and Paudi Kenneally doing most of the scoring. Danny with a goal and a point, and Paudi with a point for the first half tally of 1-2. Kerry had too much for Christophers to handle in the second half. Dingle native Paul Devane and Clare's Graham Glenn did well in the green and gold. Christophers will meet Galway Friday night in the back door round. Wolfe Tones had too much talent on board for Donegal in their opening cup game. With Keith Gill, Barry McShea, Mike O'Brien, Collie Carr, and Marty Farrell in the lineout the Tones looked impressive against the northerners. The game also saw the first back card of the Boston season issued to Christy Bell for remonstrating with referee, Brian Rooney. Donegal battled hard with Pauric McLaughlin, Mark Canney, and Declan McBride putting in a big effort, but will end up facing Cork next Sunday. The Junior C Hurling championship also opened with Worcester hosting the Hartford GAA Club. Reigning champions Worcester scored their first win with a 4-22 to 1-8 victory. Wolfe Tones and Connemara Gaels took the 3 hour drive down I-95 last Sunday to participate in the John Joe Cassidy 7-a-side tournament in New York's Gaelic Park. The level of competition was the highest in recent years and New York big guns, Cavan and Leitrim, fielded strong teams. Although neither Boston team made the semi-finals, each came within a hair of doing so, with some controversy mixed in for good measure! The teams were drawn in 2 groups of 5, with the top 2 from each group going into the semi-finals. The Gaels won each of their first 2 games against Longford and Celtics, an All-American team. Next up was Leitrim, and old friend, Brian Connor who played for the Gaels in the 2011 season, turned foe as the tall Offaly man lined out for Leitrim. The Gaels had a man sent off after 3 minutes and were forced to play 6 versus 7 for the remainder of the game. In the end it proved too tall of an assignment to turn the local team. A win against Monaghan in the final game would be required see the Gaels into the semi-finals. It was end to end stuff and there was a whisker between the teams all the way through. It came down to the last kick of the game. Monaghan apparently needed a goal from a last kick of the game free, but the ball went over the bar and the Gaels understood that a semi-final place against Cavan was earned - not so, as the Boston visitors found out shortly afterwards. Returning to the field for the semi-finals the Gaels were informed by the referee that an error was made calculating the scores and that Monaghan had in fact won the game. A controversial end to the tournament for last year's Boston champions. The Tones story was almost identical to the Gaels - although without the controversy. The 2012 winners of the tournament had similar success in their first 2 games, beating Kerry and Rockland, only to fall to Cavan in their third game. The Tones were up against it as Cavan are one New York GAA's heavy hitters. The cause of the Boston side was not helped by the discontinued participation of star player Marty Farrell who suffered a dead leg in the first game and could not continue. After going down by 2 early goals the Tones struggled all the way through, and the result left them needing a win in the final game against Westmeath to advance. Westmeath took the early lead and time ran out on the Boston side as the Tones came within a point, but could not close the gap fully. The semi-finals were an all New York affair. Cavan defeated Monaghan in a well contested affair, while Westmeath shocked Leitrim by pulling off a win against their favoured opponents. In the final it was Cavan who emerged victorious. Connemara Gaels: Sean Conneeley, Noel Graham, Chris Lafferty, James O'Donnell, Pat McNicholas, Michael Coyne, Eoin Connolly, Thomas Curran, Eddie Healy, David Burke. Managers: Martin Flaherty, Pat Nee. Wolfe Tones: Johnny Kelly, Kian Cleere, Cormac Joyce-Power, Marty Farrell, Collie Carr, Mike O'Brien, Keith Gill, Kevin Lynch. Manager: Gerry Prior.